Remember this series? The one about marriage that I started almost a year ago? Did ya think I forgot to finish it? I promise I really didn’t forget…I just have so many topics I love writing about and somehow this series kinda got off track back in October. 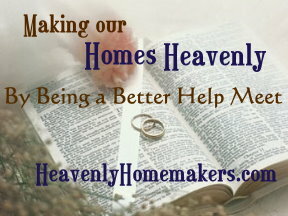 And yikes…I promised that while writing a series on being a better help meet to our husbands that I would write about THAT subject. You know, that one important subject that is quite important to address when we talk about a healthy marriage? It’s not that I am afraid to talk about THAT, but wow, I’ve sure done a good job of avoiding the topic for almost a year, haven’t I? Being a Help Meet…What Does it Mean? Any particular marriage topics you’re interested in me writing about? I mean, besides THAT? I am fairly newly married, about 18 months in but I can think of a few topics that would be helpful. 1. Dealing with difficult in-laws: we have different values/ priorities then our in laws who are non believers which tends to cause conflict. I try to support my husband and take the high road when it comes to disagreements but I think the sometimes in-laws can really contribute to a lot of stress in a marriage. more hard to keep on answering calls. People mean well and all, but for me it’s not hel;pful. Keep your hubby busy. Downtime has been the hardest for me. A little downtime is good… but too much and reality hits you. My hubby has been great… he’s offered to do the household chores, but I declined, I need to be busy! But he is cooking for me. I appreciate your advice, it is always good to hear from someone who has been there. I have dealt with a parent illness in the past, before I was married. However, I do know quite a few couples where illness, job loss, etc play havoc on their marriages. Since I have seen friends deal with these issues and it has torn some of the marriages apart I feel it might be a good idea to address ways that we can be a help meet to our husband during these difficult situations. My husband and I moved from my family 1300 miles to his family when my mother in law became ill. My husband did not want her in a nursing home. She needed care around the clock. She was blind and had demensia. So we sold what we could and packed up everything and moved to a tiny town, two hours away from everything to make sure that she was at home. It was hard, there were lots of tears and tension. Sometimes I wish I would have done things better or understood that I just needed to be there, not have all the answers. His mother passed away about a year and a half after we moved and yes, it was hard. My husband took care of her. We had hired help but they sometimes are not dependable. It came down to my husband stayed at home with her and took care of her. The memories that we made in that time together are priceless. My husband feels at peace that we did everything we could to make her time with us comfortable and special. We had birthday parties and huge christmas parties, as well as the stories she would tell when it was just us at home. There are so many good things that came out of our difficult decision and sacrifice that are just so priceless to us now. My biggest lesson was to embrace friends, church, and God. So many prayers were heard and answered. Umm, maybe how to encourage them to be a better Christian leader but indirectly. You may have to let go of your expectations and your definition of what his “Christian leadership” should look like. Laura, can your techy fix the comment boxes so we can see the entire comment?? Thanks! Totally agree with this request! I’ve talked to my husband directly about how, now that wee have a child, it’s more important than ever that he lead us. But he didn’t grow up in a Christian home, doesn’t know what that looks like, doesn’t know where to start. And complains that he’s too busy. What else can we do? Prayer is #1… but once you’ve got that covered, you can try to make sure you are going to a church that encourages men (not just women) to serve. When men serve alongside other men, it spurs them on to be better leaders in their families. I would agree with Nora about communication. And Nora, I will be praying for you, five years in and my in-laws aren’t on the same page either my husband has had to choose and well it makes for very lonely times. I pray you will not have to go that far. Thanks so much for your prayers. I will keep you in mine as well. I completely understand the loneliness, we are at that point with my in-laws my husband doesn’t want a relationship with them anymore because of their antics. I pray often that hearts will change. How about getting “Him” to lose weight and at least “pretend’ to do some exercise so you don’t lose him way before his time. You can cook healthy but if he’s eating out due to his job and “won’t” brown bag it, what’s a girl to do? Wow, I’m anxiously awaiting, now that I know you’re going to tackle THAT subject! THAT is a sore spot in my 5 year old marriage. It’s just about the only thing we don’t agree on. God is good. I was just thinking about writing you an e-mail about something along the lines of this topic. Wasn’t sure what to write or really what I was inquiring for…. so I didn’t. Marriage is tough work. Even the good ones. I have an incredible husband and his parents worked very hard to raise all their children to be Godly. I’m emotionally unstable pretty much every day. He’s consistent emotionally, physically, financially and all the other ways you can be stable. This is definitely a good thing for me. “Your husband always comes first, even before your kids.” This was the one piece of advice that seemed to be consistent from the older women in my life that also have good marriages. Been married almost 3 years now and I haven’t succeeded in that area. My husband never complains about how much I get done and tries to help when he’s not working. We’ve got 2 kids one year apart from each other and we got pregnant right after we got married. I hope to finish reading your past posts – I didn’t discover your blog until like…September? I am looking forward to reading about THAT because it’s still a taboo subject among many Christian women. My husband and I are still quite young and have a lot of learning to do overall, but recently we had a baby and my husband (at the ripe age of 24/25) developed serious back problems. Which has an effect on THAT part of our relationship. :-) I look forward to future posts! I have spent the last several days reading all the previous blogs and comments. I have truly enjoyed them and eagerly await more. These are truly a blessing.